We all have situations where we put up a front and project the image of who we want to be in that moment, versus who we really are (or, who we feel ourselves to be). This is human and not really an issue in the grand scheme of things, but problems can arise when we’re spending too much time wearing these masks, or we dislike the person we become when we sport this other persona. As we navigate our midlife crisis and midlife muck, we start to uncover our truths, which have been buried under everyone else’s truths for too long. When we make these realizations, we may see that the life we’ve created for ourselves doesn’t line up with who we are (cue the midlife crisis phase!). But, as most of us quickly realize, we can’t just pump the brakes and immediately walk away from all the things that no longer fit us. We have bills to pay, health insurance to maintain, responsibilities to meet, and expectations to uphold. While some of the masks we wear aren’t harmful to us, if we don’t maintain a distance between the mask, we may end up hating ourselves and limiting our ability to see the options for making the changes we desire. So, what do we do when we’re in a situation that doesn’t fit, feel stuck, and don’t like the person we’ve become to make it through each day? I’ve already alluded to why we wear these masks, to begin with - we want to hide in the moment, or project a different image of ourselves. Or, it could be ego based - we don’t want anyone else to know something is less than perfect, or we’re struggling with something. Or, it could be need-based - we need to be a certain way to get things done. None of these are inherently bad, and in some ways they may protect us, or give us a little space, to ease our way into the reality of the situation. For example, if we’re having marriage trouble, I think it’s perfectly acceptable to hide that from others since it’s not everyone’s business!! But, sometimes we wear certain masks for too long, or they feel uncomfortable enough to make us miserable. That’s when we start to run into problems. We all have core values upon which we make decisions and feel aligned with our moral compass. Even if we’ve never taken the opportunity to figure out the values that drive who we are, we still base our actions on those values. When this happens, the guilt and the self-judgment create a perfect storm that may contribute to more significant health concerns like anxiety and depression. Even if it doesn’t extend that far, it makes each day more challenging than it needs to be, and our opinion of ourselves below where it should be. The stress that comes from living our lives in this way can create lasting damage to our health, which is why it’s important to get a handle on these masks and underlying feelings. It can feel challenging to take off masks that cause us stress, guilt, discomfort, etc. That may sound counter-intuitive because if it’s harming us, why wouldn’t it be easy to rip that thing off and be done with it?! Well, while those masks provide a host of nastiness, they also offer protection. It could be protection from judgment or failure; it may even feel required to get our jobs done (whether that’s a paid or unpaid position!). To take the masks off, we have to be okay with being seen as who we are. We have to be strong in our self-worth to know that our health is better than how we think others see us. It’s being confident in our flaws, our mess, and our opinions to put it out there anyway. If we’re in a position, however, where we can’t take off the mask (i.e., a job that requires us to be a certain way), then we have to make a choice: leave the job or situation, or learn how to distance ourselves from the person we need to be in that moment. For example, let’s say you’re in sales and you feel your boss expects you to be pushy, manipulative, and cutthroat to hit your sales targets. But, while you can be that person, you go home every night hating the person you become at work. You can’t even look at yourself in the mirror! If you’re not in a position where you can leave the job, then you have to learn to recognize that work-you, isn’t you. Think of it as playing a part each day. That won’t make it easier to do the job, but over time, if you distance YOU from the role you’re playing, it can make it more manageable and allow you to not see yourself as that horrible pushy, manipulative person (because you're not!). Wearing masks is a part of life, so long as they don’t make you feel bad or get in your way of enjoying life. When that happens, it’s time to reassess what you’re hiding from or analyze the person you must become by wearing the mask to see what needs to change. 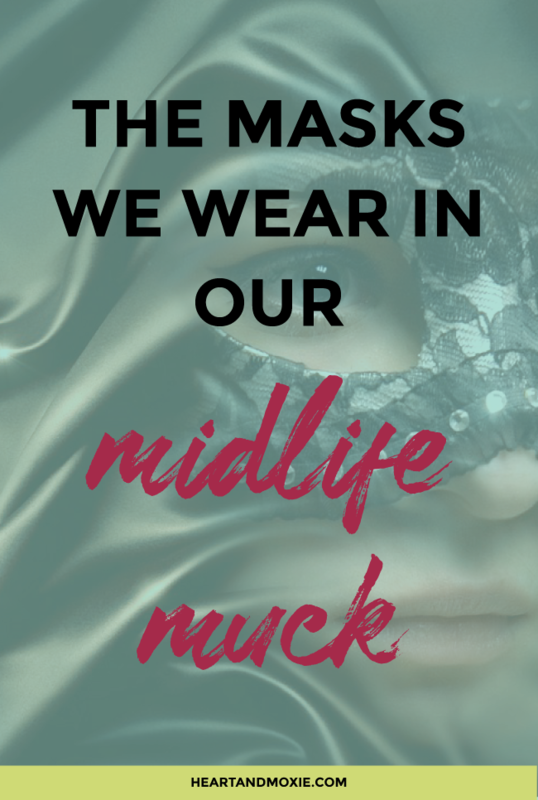 As you navigate your midlife transition, you will undoubtedly be in positions where new masks will slide over your face. That’s part of the process, but if you use those to your advantage, it’ll help you identify the elements of your life that need a reboot!